Vocabulary, grammar, and cultural information are presented in this new Breaking the Barrier ebook in a way that can only be called revolutionary. All chapters begin with colorful photos and maps of Spanish-speaking countries, important cultural facts about each, as well as biographical information and pictures of famous people. Targeted vocabulary comes to life with the touch of the screen where a picture emerges and a native speaker pronounces the new word; all exercises throughout the book are interactive – a touch of the button shows a student immediately if an answer is right or wrong. Crystal-clear audio recorded by native speakers gives students the opportunity to answer questions and then compare with those of the experts. Students can work at their own pace by hitting a pause button or by playing a clip again. The controls are intuitive and easy! Flashcards are built-in for all new vocabulary in each chapter. 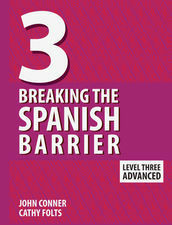 In this Level III book, ideal for advanced students (including AP students and those preparing for SAT Subject Tests), all important grammar of the Spanish language is presented (present, preterite, imperfect, future, conditional, compound tenses, subjunctive mood) along with the classic grammatical structures. Hundreds of exercises reinforce the amazing explanations offered by one of the country’s leading language teachers. As a special feature, all even chapters feature a cultural article, complete with comprehension questions, professional recordings of the article, music, and video sequences. Combining the brilliant instructional features of the Shelfit E-Reader with the winning approach developed by acclaimed teacher John Conner, dean of faculty at Groton School and former member of the Spanish AP Test Development Committee, this groundbreaking digital version of the series is just what any language learner needs to excel.